Collision avoidance will be more practically and universally achievable, even in skies crowded with unmanned aerial vehicles (UAVs), if the aviation community takes advantage of the raw measurements already present in today’s GPS receivers, but largely ignored in favor of using GPS position coordinates (see “The Advantages of Raw Measurements” sidebar, below.) Changes to existing aviation equipment could enable aircraft to estimate the flight paths of other aircraft far more accurately enabling safer operations even under impaired conditions. The use of the raw data, once integrated into standardized flight protocols, could dramatically help prevent midair accidents even if one or both of the aircraft is unmanned. This flight-validated approach uses established algorithms, readily available universal access transceivers (UATs) and existing communication message formats (as described by P. Duan et alia in Additional Resources). There is one essential departure from current practice: including the raw pseudorange and carrier phase data within the automatic dependent surveillance-broadcast (ADS-B) messages in place of the derived position coordinates. This same approach could be applied with great benefit should a separate system, similar to ADS-B, need to be developed to support UAV operations. For more than 50 years it has been feasible to combine intermittent partial data – of different types at varying accuracies with different sensitivities from different directions at different times – and extract all benefit therein. The seemingly unspectacular step of using raw measurements in the message opens the door to using powerful, widely understood methods for predicting flight paths — and therefore the points of potential collision — and handling situations where position determination is hampered due to jamming or because there are not enough satellites in view. It should be possible to do all of this for aircraft at various altitudes without building and certifying extensive new radar or other ground infrastructure. This paper primarily involves GPS and airborne operation, but a half-century of experience combining data enables this technique to be dramatically extended. Integration of different sensors (eLoran, DME, etc.) is straightforward; a claim that has been verified and documented. For a host of reasons, techniques using raw measurements — which are present in any navigation sensor — will outperform by orders of magnitude techniques relying on position reporting. Differential GPS (DGPS) owes its spectacular success to its use of raw measurements. A Kalman tracker uses weights based on an extensive array of data. There are across-axis correlations between error components in different directions, between components of position and velocity, etc. — and the sensitivity of each individual observation to every one of those components is taken into account. Unfortunately none of those features can be used when starting with coordinates derived from raw measurements. Since ADS-B link bandwidth can’t hold its existing content plus all that correlation information, ADS-B messages contain no correlations — but airborne computation armed with a history of raw measurements can deduce all. The contrast could hardly be more compelling. The extended squitter message can remain unchanged except for the replacement of position and velocity by raw measurements. Since navigation systems commonly allow multiple message types, however, position reports are not strictly ruled out. Occasionally another message type could be used to broadcast the position for, say, track file initiation. To realize the performance potential, however, messages containing raw measurement data would be far more frequent. But why go to the trouble of changing an established methodology (that is position reporting) for one based on Kalman filtering considerations? There are multiple reasons. Probably most obvious, instantaneous position is fleeting for anything airborne; data must be combined. Even satellite navigation uses several observations to get a position fix (i.e., four satellites in air). Another reason stems from the nature of the position that must be determined: To support collision avoidance the position information for one object must be determined relative to the other objects in nearby space and projected into the future. Using raw data makes these calculations far, far more accurate. Consider, for example, a pair of position coordinates, one with perfect longitude but a kilometer of error in the north direction, and the other with exact latitude but its east/west position is off by a kilometer. Averaging them gives “only” 500 meters of error in both! Even if different tolerances of different position reports are taken into account, ignoring wide variations in sensitivity and correlation parameters is ruinous. There are no tight velocity accuracy requirements specified for ADS-B as a result. In fact the velocity requirement for ADS-B is loose in multiple ways. For characteristics that matter in regard to collision avoidance, velocity is a vector — a vector relative to other objects in nearby space regardless of those objects’ latitude or longitude — and with errors having statistical properties. Error values of several meters/second, even as much as 10 meters/second, have been published in connection with ADS-B. A more subtle point is that even a substantially lower 1 meter/second error value is dangerous statistically. Without detailed elaboration, this much needs to be recognized: extreme value theory (EVT) shows that, even if all errors were Gaussian, mixed Gaussian probability offers far less assurance than intuition would suggest. Instances of exceeding 10 sigma cannot be discounted (see Farrell J., and F. van Graas, Additional Resources). To ignore that is to accept an excessive and unsafe risk; “unlikely” is often not unlikely enough. A 10 meter/second error is therefore not too farfetched to consider. A sequence of position reports can suffice for transoceanic flight but not within crowded airspace. Avoiding mid-air crashes requires a fresh look at system priorities. For example it is not critical to have highly accurate position reports. For airliners with wingspans tens of meters long moving at hundreds of kilometers per hour, precise position is fleeting and unnecessary. A few meters of current position error will be insignificant and working to refine that position error would be pointless. It is essential, however, to have highly accurate velocities. The product of (velocity error) × (time to closest approach) is dominant when it comes to collision avoidance. Instead of meters per second velocity accuracy, airliners need centimeters/second accuracy; otherwise the projected position over time is so crude as to be useless for collision avoidance. Collision avoidance demands assurance of sufficient distance at time of closest approach. That clearly requires accurate knowledge of velocity — specifically the relative velocity vector. Stitching coordinates together from reports of latitude + longitude + altitude (“LLH”) cannot deliver that, which explains why ADS-B does not promise good velocity. Errors of 10 meters/second have been published with little elaboration (not relative, not vectorial, and with no statistical boundaries). If the closest approach is a minute away, then even the most elementary arithmetic assigns 600 meters of uncertainty to that future position. Consider, for example, two aircraft flying at the same altitude: “Ownship” at location O with velocity VO and “Another-ship” at location A with velocity VA (see inset photo, above right). They are instantaneously separated by vector R which, for closing scenarios, is shrinking. The closest approach will occur at time T when the component of relative velocity (vector difference VA – VO, not shown) parallel to R passes through zero — the perpendicular component is miss distance. That simple scenario has appeared in countless context-dependent forms (e.g., with intruder at A and evader at O in or with target at A and an interceptor or projectile at O in military operations). Determination of T and minimum separation distance follows easily from relations just stated, readily superseded whenever maneuvers subsequently change either velocity. Now to confirm the case for precise velocity: rather than current position, collision avoidance requires accurate future position (i.e., at time T). When position is projected T seconds ahead, a 10 meter/second velocity error will cause that predicted future position to be in error by 10 T meters. With that much error in each of two horizontal axes that product will be squared, producing an unacceptably large area of uncertainty. Trying to steer away from an unknown place has no meaning. The Traffic Collision Avoidance System (TCAS) uses climb/dive maneuvers instead. Imagine that becoming a commonplace event as the skies fill with unmanned aircraft. Sightline rotation increases at close range — exactly the waterloo for collision avoidance! Requisite speed changes and T have been quantified for many cases (see Farrell, J., “Collision avoidance by speed change,” Additional Resources). As noted in the article on airport surface surveillance (J. Farrell and E. McConkey, Additional Resources) computers now can easily maintain integrated track files for every participant in any scenario. Even in the 1970s two missiles plus two aircraft were simultaneously tracked in real time with an electronically steered radar antenna at White Sands. The estimation algorithms in the White Sands case were fed by raw observations (range, azimuth and elevation in that case) — never with coordinate pseudo-measurements — and tracking from high dynamic platforms with “Ownship” navigation is a straightforward extension of tracking from a stationary location. Today’s computing capabilities readily enable each participant to maintain a bank of extended Kalman filters (EKFs) with a separate track file for each participant and with every participant having a designated slot in the sequence of transmitted messages from all the participants. The full set of participants should include every object that could be involved in any collision. The track file in any participant’s database is not tied to coordinates; it’s scalar. From those scalars each participant can construct a set of vectors and all those vectors will be correct and can be expressed in his own perceived reference. If that perception differs from the other participants’ (due to misalignments or even a different datum), performance does not suffer one iota. Air-to-air tracking has always placed the Ownship described in the example above at the center of its “own little world” without any degradation. What matters is relative state (position, velocity…) in Ownship’s “own little world” expressed and maintained consistently the same way for all. Sharing satellite navigation data with others will not introduce any error since those measurements are scalar —unattached to any coordinate frame. If the presence of one participant with overriding authority must be identified, one of the participants could be a tower. With the exception of the tower, if there is one, moving participants would make path adjustments with each message received as the scenario unfolds. Those smaller, repeated adjustments over time will prove far less abrupt than making a start-from-scratch change at close range. Using the raw data also enables the development of track files in situations where there are not enough GPS satellites in view. In fact, in some urban canyon scenarios it is possible to have situations where there are never enough satellites available with good enough geometries. As things now stand, if an aircraft’s GNSS receiver does not have enough satellites in view it is not able to determine its position and therefore has nothing to broadcast on ADS-B. That is a scandalous waste of very accurate information. Raw data measured every second or so will give you a far better track file than the usage of GPS coordinates. Stitching coordinates together to get velocity gives totally inadequate performance. That is why ADS-B, even with all the ADS-B Out and ADS-B In information, will not provide accurate velocity. While UAVs will be responsible for taking evasive action, they will be less burdened in other respects. Their lower speed affords multiple advantages: more time for evasion, track file initiation at short range (allowing operation at low power) and the ability to make tighter turns. All of these factors make sense and avoid easier for UAVs than it is for fast-moving airliners. Nor will UAVs require the sophistication used by P. Duan et alia in Additional Resources, which used 1-second changes in meticulously prepared carrier phase measurements. Many satellite navigation receivers don’t use carrier phase but all have pseudoranges — those will suffice as long as they are made available with appropriate time stamps. Also, decimeters/second rather than centimeter/second velocity error will be acceptable — again because of a UAV’s slower speed. With evasion by acceleration or deceleration, for example, the simple program (see J. Farrell, “Collision avoidance by speed change,” in Additional Resources) can just have different parameters. Finally, evasion strategy won’t be limited to speed changes; descent or turns can be used in some circumstances. Though the advantages of using raw measurement are clear, change is not easy. Using position, and over recent decades GPS-derived position, in ADS-B messaging has long been the established approach. However the integration of unmanned aircraft is such a monumental challenge that new techniques and air traffic management systems for UAVs are being considered. Incorporating raw measurements not only offers a capability that supports safe UAV integration, but offers real advantages to manned flight operations as well — and there is a rock-solid track record supporting both double differencing (see “Double Differencing” sidebar, below) and all modes of tracking (air-to-air, air-to-surface, surface-to-air, surface-to-surface) by adaptive modern estimation. Working with the raw measurements instead of relying only on the position calculated using those measurements makes it possible to apply the techniques that made differential GPS so spectacularly successful. This approach also opens the door for the integration of data from information sources completely different from GNSS and from each other. Raw measurements offer the only way to achieve true integration with systems like DME, eLoran and Iridium and, especially for cooperating UAVs, signals-of-opportunity (see R. Kapoor et alia, Additional Resources).The scope can also be extended to include observations of nonparticipants (see Fig. 9.4 in J. Farrell, “ GNSS Aided Navigation and Tracking – Inertially Augmented or Autonomous,” in Additional Resources). The improvements in situational awareness are dramatic enough to suggest redefining availability and continuity of operation. Less obvious but equally decisive is how this approach strengthens integrity. Every individual measurement can be acceptance-tested — directly, easily, and independently of all others, supported by demonstrated equivalence to rigorous, widely accepted parity methods (see “Integrity Testing: Ultra-simple And Rigorously Validated” sidebar, below). These dramatic improvements do not require new discoveries or the invention of new equipment. A revision of the ADS-B message content, hopefully via a software update — and the inclusion of raw measurements in any new system developed to support UAVs — will enable a host of spectacular benefits from already readily available data. In fact the use of raw measurements is so promising that SAE International has begun developing standards to bring this approach into the mainstream. There also are documented non-proprietary navigation algorithms already available that make it possible to tap the value of the raw measurements. These algorithms could help keep costs down and speed the launch of a pilot project to test this approach, especially in the case of unmanned aircraft. There is enormous commercial, political and regulatory pressure to integrate UAVs into the national airspace. A pilot project could support both manned and unmanned aviation by strengthening reliability and robustness while boosting accuracy and integrity — thereby helping keep aircraft out of each other’s way. 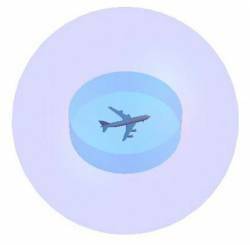 An old movie scene showed Bob Hope trudging through a desert, desperately uttering “water, water” — then finding himself waist deep in a stream moments later, mumbling “mirage, mirage.” The advantages of using raw measurements for ADS-B and systems similar to ADS-B are not a mirage. Between what we know and what we do is a wide gulf. Let’s close it. Two separate but related articles from a recent Institute of Navigation newsletter discuss important developments in GPS/GNSS interfacing. Starting on page 1 and continued on page 7, the first describes major improvements in Android handsets. The second, on pages 14-15, announces formation of a Society of Automotive Engineers (SAE) International working group, which will work on the standards cited in the Conclusions and Recommendations section of this article, ensuring the extension of benefits to the vast majority of devices. (SAE International is a global association of more than 128,000 engineers and related technical experts in the aerospace, automotive and commercial- vehicle industries.) These were preceded by other publications emphasizing the benefits offered by working with measurement data. One, more than 25 years old (J. Farrell and F. van Graas, Additional Resources) was in fact preceded by an obscure (1977) NAECON paper. Two more recent videos here and here plus a presentation offer additional background. The centimeter/second residuals achieved in flight test described previously by P. Daun et alia, in Additional Resources, were obtained by using sequential changes in carrier phase measurements measured once a second. Unlike the carrier phases themselves, 1-second changes in them are interoperable (i.e., regardless of different timing and/or geoid conventions used for separate constellations) and immune to catastrophic error (see links to https://jameslfarrell.com content in Additional Resources). Furthermore, because two main sources of propagation error change very little over a second, there is no need for a mask angle — a trait that benefits geometric dilution of precision (GDOP) for velocity. 1. Bayliss, E., R. E. Boisvert, M. L. Burrows, and W. H. Harman, “Aircraft surveillance based on GPS position broadcasts from Mode-S beacon transponders,” ION-GPS94. 4. Farrell, J., E. D. McConkey, and C. G. Stephens, "Send measurements, not coordinates," NAVIGATION, Journal of the Institute of Navigation, Volume 60, Number 3, 1999, pp.203-215). 9. Farrell J., and M. L. Farrell, “ADSB (2nd-) Best Foot Forward?” Journal of Air Traffic Control, Summer 2008, 44 17-18. 11. Farrell, J., "Single-Measurement RAIM"
13. Farrell, J., "Dead Reckoning by GPS Carrier Phase"
14. Farrell, J., "1-sec Carrier Phase (again)"
17. Van Sickle, G., “GPS for military surveillance,” GPS World, Nov. 1996. A 2012 flight validation used GPS without augmenting system corrections but with raw measurements from receivers. Twenty years earlier Lincoln Labs successfully demonstrated GPS broadcasts with Mode S beacon transponders at Logan Airport as described in E. T. Bayliss et alia. (Note: the 2012 flight in the first case used UATs instead of Mode S). Transmitted positions enabled each participant to track every other participant’s data while minimizing or eliminating garble, by replacing conventional interrogations with information in assigned time slots (as ADS-B currently prescribes). One basic modification of the Lincoln Labs methodology was advocated in the work by J. Farrell and E. McConkey and linked with another system — the Joint Tactical Information Distribution System (JTIDS) to form a more general application. Instead of coordinates, the transmitted message’s 48 information bits can contain raw uncorrected measurements. Data compression and the cycling of in-view GPS satellites can mitigate bandwidth limitations. These benefits are utterly absent if calculations must rely only on instantaneous position reports. Volumes have been written on Receiver Autonomous Integrity Monitoring (RAIM), often supported by sophisticated analytical methods and substantial mathematical development. The good news is the hard work has been done. All a program needs is a set of expressions to put into code. Even more fortuitous is further simplification of those expressions—and that also has been done. Moreover, the way that simplification has been done allows extension beyond GNSS, to include every morsel of data used for navigation. Support by rigorous theory (matrix decomposition etc.) with no need to employ it in operation. The normalized parity scalar test for every individual measurement (everyone understands a dimensionless scalar random variable with sigma = 1) provides a vital means of operating with any and every available source of navigation information. Ignoring wide variations in sensitivity and correlation parameters is ruinous, but it is possible to recover that information. Let every participant compare his own data from each separate satellite to corresponding measurements from all other participants, weighting every individual difference adaptively according to its information content (we’ve been optimizing partial information weights for a half century). A rock solid track record supports double differencing and all modes of tracking (air-to-air, air-to- surface, surface-to-air, surface-to-surface) by modern estimation. A sequence of position reports can suffice for transoceanic flight but not within crowded airspace. As noted in  computerized “bookkeeping” can easily maintain track files for every participant in any scenario.